Stefanie Goldstein’s voice and style are like that of no other. Her angelic coloratura and impressive range have been dazzling audiences for years. It’s as though nature itself comes alive when she performs, awakening all of the listener’s senses. She is truly a Diva, in every positive sense of that grand term. Her voice, described as “pure, silvery and ethereal,” has shined during performances with the San Francisco Lyric Opera, the Golden Gate Opera, Urban Opera, San Francisco Renaissance Voices, the La Jolla Symphony Chorus, and the Stockton Chorale, among others. 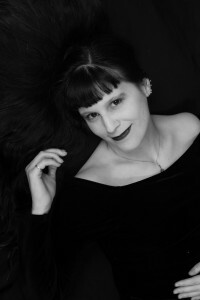 She also performs a wide variety of repertoire, including early music, opera, musical theater, and even gothic rock. Stefanie was born on a Friday the 13th, but that was lucky for us! Raised in Lodi, California, by parents Terry and Cora Sue Wetter, Stefanie is the youngest of two and has a brother named Spencer. She started her musical journey at the age of five with piano lessons, and stayed with them until the age of twelve. She then started going to youth groups at St. Anne’s Catholic school, and found that she kept getting compliments and praise on her singing abilities. This sparked her interest to join the choir at Lodi High, where she won several honors. She continued to sing through her time at Joaquin Delta College. Stefanie has continued taking voice lessons for fifteen years but shares, “Even though I am a classical singer, I’ve had somewhat of a non-traditional music career. I love the merging of classical with rock music and enjoy having a foot in each of those worlds.” Stefanie’s influences include Annie Haslam and her band Renaissance, Dame Carolyn Emma Kirkby, Kristy Thirsk, and progressive rock/folk bands of the 70’s. Stefanie moved to San Francisco eleven years ago and was drawn to the Bay Area by the ocean, the culture and magic that she always felt about this area. Stefanie currently sings in a gothic ethereal band called Accolade. It is technically a rock band, but Stefanie sings in a classical style. Accolade uses a lot of fun and colorful instrumentation, such as that provided by mandolin, harpsichord and recorder. Stefanie’s husband Aaron plays guitars, keyboards, and various other instruments in the band. There is also a drummer who just joined the band last year. Accolade is getting ready to release its second album on vinyl, and just returned from a tour in the Pacific Northwest to promote this new album. For three years now, Stefanie has also served as the head singer and the music director for the Chapel of the Divine Mother. Stefanie additionally performs in a medieval and renaissance musical duo with her husband. You can view and experience Stefanie Goldstein at www.stefaniegoldstein.com and www.reverbnation.com/divastanie and her band Accolade at www.youtube.com/accoladesf, www.accoladesf.com, www.facebook.com/accoladesf, www.reverbnation.com/accoladesf, and www.soundcloud.com/accoladesf.